I totally loved my watch recently purchased from Overstock: August Steiner Quartz Luxury Gold. Stylish, elegant, making a statement w/o being gaudy. Love, love my watch. I totally recommend it! This August Steiner timepiece is a luxurious work of art. 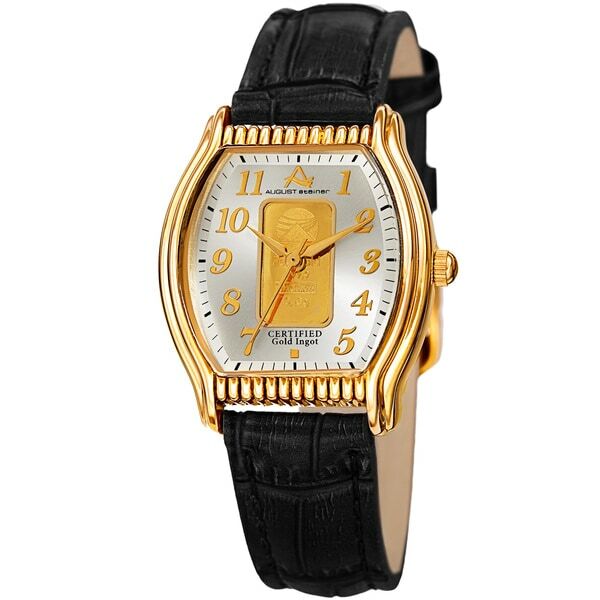 The certified plate of pure gold at its center and embossed genuine leather strap enrich the chic and sophisticated design. This unique watch will make the perfect accessory for your formal attire! I just received my watch and I love it. It is everything I expected. I can adjust the fit with the leather strap and I love the gold design in the middle. It looks very expensive and can still be won everyday. The free bangle is awesome. My baby granddaughter is thrilled with it wiggling it around my wrist. I am fully satisfied and I believe the watch will work just fine. Thank you. Love the watch. I bought 2 more and wanting to buy more. They’re so elegant, not embarrassed in wearing everywhere and even in everyday babysitting. I am looking for more gold-tone with easy to read Roman numeral. There prices are affordable even fir someone who’s retired like me. Gave a 5 star rate. Thanks. I wore this watch to the Ballet and durning intermission I received several compliments. I ware this watch casually, professional and sometimes daily. I’m so happy with the quality that I got for a more than reasonable price. Oh yes and the slow movement of the minute hand is like that of a fine Rolex watch. The band is indeed real leather. Stylish, with interesting details around the face as shown. This face is larger than the average women's watch. And in the center, an actual 0.1 gold ingot. Yes, I am happy with this purchase. It is very stylish and I love the size. I have worn it one time and had so many compliments on it. I would recommend this purkchase. Very, very pleased with this watch. Gorgeous watch. I decided to get this particular one because of its shape, my wrist is very small and the fit is perfect. It also looks very expensive, but overstock has a reasonable price. I love my new watch, it's a great size, I have a smaller wrist but it looks great. I've had several compliments on it. Awesome Watch..Perfect For Every Day and Dressy Occasions. Great watch- all details are in the picture. I love this watch because it's gorgeous and isn't too small or too large. I can actually see the time without glasses. It's hard to find a watch that one can wear everyday yet is also appropriate for special occasions. It fits my wrist, and it keeps the correct time.